Robert Weide recently did a great live Facebook interview with Woody Allen, well worth seeking out. As part of that conversation, they discussed the affection audiences sometimes inexplicably have for some director's films but not others, Allen citing as an example Billy Wilder. For Allen Some Like It Hot (1958) is a nothing film, a trifle, while other Wilder movies - Woody cites Ace in the Hole (1951) - inexplicably don't click with audiences and are unjustly ignored. I'd agree this is especially true in Wilder's case, whose two most acclaimed films, Some Like it Hot and The Apartment (1960), as well as his greatest commercial success, Irma la Douce (1963), are well-crafted but rather ordinary, better written and a bit chancier than if an ordinary filmmaker had made them, yet not nearly as good as other, better Wilder movies that, in some cases, were met with hostile derision, particularly Kiss Me Stupid (1964) and Avanti! (1972). That's also largely true of One, Two, Three (1961), a Cold War farce that lost a lot of money when it was new. Some Like It Hot may be the popular favorite among Wilder's comedies, but One, Two, Three is by all odds his funniest. By design it's frantically paced, like a 33rpm record played at 78rpms. Star James Cagney famously was so worn out by the reams of hilarious, densely packed rat-a-tat dialogue that, after it was done, he promptly retired. Nevertheless, Cagney gives one of the best performances of his career and One, Two, Three is one of the greatest film comedies ever made. The movie was both filmed during and is set in the months prior to the closing off of East Germany and construction of the Berlin Wall (beginning August 1961, four months prior to the film's release). Cagney is C.R. MacNamara, the head of Coca-Cola's West Berlin office. Ruthless, conniving, and ambitious, early scenes have "Mac" plotting with three equally dodgy Soviet trade representatives (Leon Askin, Ralf Wolter, and Peter Capell) to open the Soviet market. However, Atlanta-based company president Wendell P. Hazeltine (Howard St. John) nixes the idea, instead ordering Mac to look after his wayward 17-year-old daughter, Scarlett (Pamela Tiffin), who's on a carefree tour of Europe. Her short stay in Berlin inexplicably last two months, and with Hazeltine and his wife arriving soon to collect her, Mac is horrified to learn that she's secretly married Otto Piffl (Horst Buchholz), a militant Communist from East Germany and, further, Scarlett is pregnant. One, Two, Three is ingenious on many fronts. It satirizes American capitalism, Soviet and East German Communism in equal measure. It pokes fun at officious German Coca-Cola employees, many former Nazis eager to shed their past lives. Although the entire cast is good, with Leon Askin and Hanns Lother as Sclemmer, Mac's personal assistant, standing out particularly, Cagney is really the whole movie, dominating and domineering from start to finish. It's probably not an exaggeration to guess that Cagney has three times as much dialogue in One, Two, Three as the average lead actor in a comedy. In short in matters vegetable, animal, and mineral, he is the very model of a modern corporate executive. Wilder and writing partner (and associate producer) I.A.L. Diamond remarkably succeed in maintaining an incredible breathless pace from start to finish, and almost every scene, indeed nearly every joke, ranges from highly amusing to hysterically funny. The pacing is complimented by Wilder's funny use of preexisting music adapted by Andre Previn, notably Aram Khachaturian's "Sabre Dance," but also very funny use of pop music as well, particularly "Yes! We Have No Bananas," sung entirely in German by a downtrodden East Berlin hotel band. The pacing is also helped considerably by Wilder and Diamond's varying the comedy from long Lubitsch-esque scenes of dialogue with a big, funny chase sequence, as well as the style of the comedy itself, which alternates between labyrinthine dialogue satirizing capitalist duplicity, double-entendres (often about Mac's fringe benefits-obsessed secretary, broad slapstick, and wonderful little vignettes like the bouncy, hotel scene, with its perfectly-timed sight gag of a painting of Khrushchev jiggling out of its frame to reveal one of Stalin underneath. Everything goes by at such a rapid pace it's easy to miss the non-stop jokes and subtleties, including the ambiguous ending. * The plot might just as easily made for great drama, with its Bad Sleep Well conspiring, Mac's framing of Piffl and having him arrested and tortured (here, with a recording of "Itsy Bitsy Teeny Weeny Yellow Polka Dot Bikini! "), a rescue and yet more deception. Easy to miss, too, so effortless is it, is Wilder's underrated production know-how. He seamlessly matches exterior footage shot on location in Germany, inside a Bavarian studio, and on soundstages in Hollywood, particularly fascinating in the airport scenes, which utilize a huge painted backdrop and forced perspective, which only the detail of the HD transfer give away. Filmed in Panavision and in super-crisp black-and-white, One, Two, Three looks excellent, if a tad less pristine than recent Blu-ray releases of Kiss Me Stupid and The Fortune Cookie (1966), likewise in black-and-white ‘scope. The 2.0 DTS-HD Master Audio mono is also good, and the region "A" disc is supported by optional English subtitles. A reversible sleeve features Saul Bass's original poster art on the other side. Supplements include an excellent audio commentary by Mike Schlesinger, and brief but entertaining interviews with Wilder (who can't sit still), probably filmed in the early 1990s. A trailer is also included. 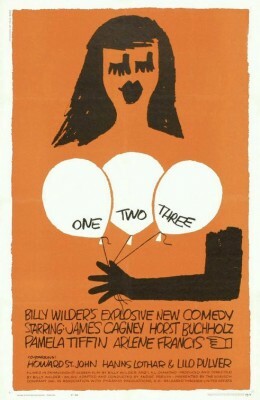 One of Billy's best, One, Two, Three is one of the great film comedies and thus a DVD Talk Collector Series title. * Was Piffl really militantly Communist, or was he shrewdly plotting a lucrative escape from East to West all along? His charade before his new in-laws is just a little too convincing to accept at face value.